A new special tank wagon for the transportation of sulphur dioxide. 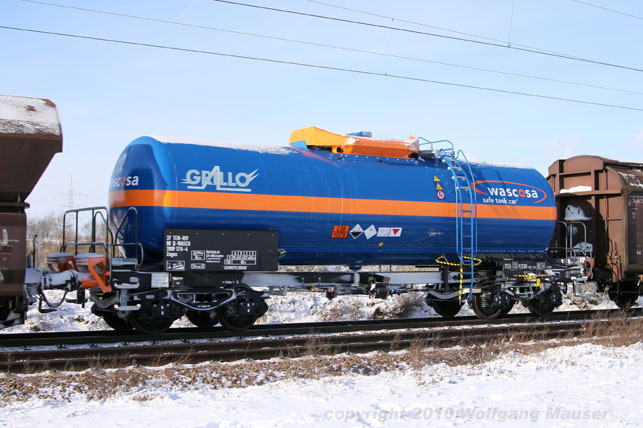 GRILLO from Duisburg has hired 80 of these wagons from WASCOSA, which were built in 2010 by TATRAVAGONKA. Est contributes to the innovative safety package of this vehicle with the Supra Buffer type G2-100 MB, the anti-climibing module AC04 and the overroll protection UE01, all of which are proudly highlighted on the vehicle with a bright orange livery. EST played an active part in the development and optimization of this advanced safety concept, which received the fitting name "Safe Tank Car ®" from WASCOSA.